The unit shut down order, and/or redundancy. Using the one or more order from the above loads control methods will result in smaller size generators than a full-load system, and will have a significant savings in purchase price of the generators. It is the process by which the customer identifies what electrical loads are needed and in what priority. 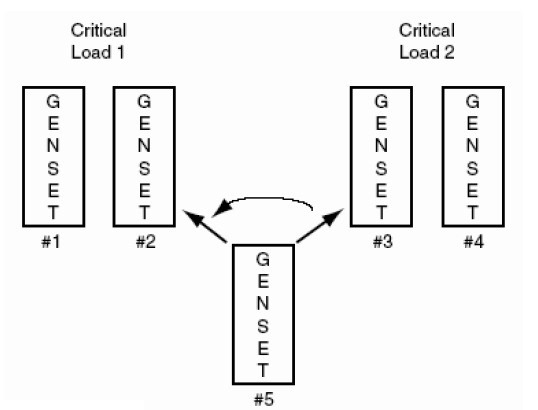 The highest priority loads would be in the first step; even if all the generators are not ready for load. The first generator ready to accept the load would take the first priority loads. The next step would go to the next highest prioritized load. This process will repeat until all loads are applied. Smaller load steps equate to smaller transients, which result in a smoother transition. For example, a medical center might prioritize lifesaving equipment as their number one need. That equipment (or special outlets for that equipment) would be the first supplied with electricity from the first available generator. Lights may be identified as the second most important need and handled by the second load step. When starting generator sets without a preferred load order, it is suggested that the largest loads are started first. 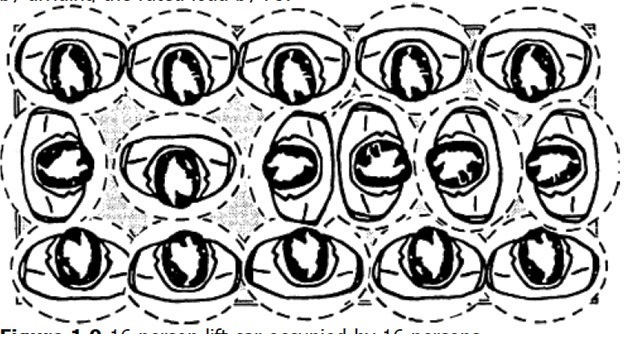 The largest transient will occur before the system is heavily loaded. These large loads will have the least effect on the rest of the system. A block load refers to the percentage of rated power at rated power factor instantaneously added to the generator. For example, if a generator is rated 1000 kW at 0.8 pf and a 250 kW load at 0.8 pf is applied to the generator, a block load of 25% [(power applied/rated power) x 100%] is applied. 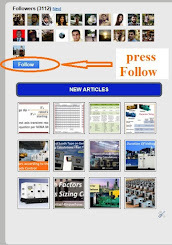 Load steps refer to the amount of load that will be placed on a generator at one time. 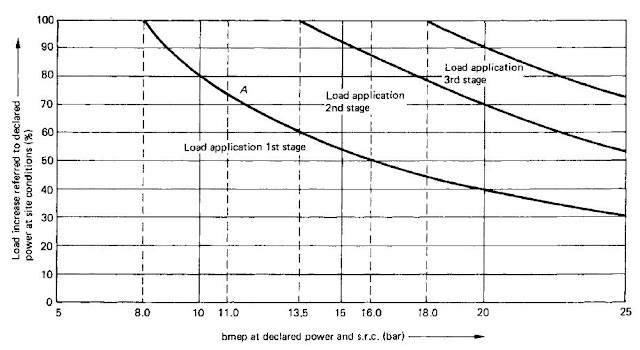 Load acceptance order determines which loads must be accepted by which generator. When block loads are large, sometimes a generator may accept the loads in one load step or they should be accepted in smaller portions in various steps. 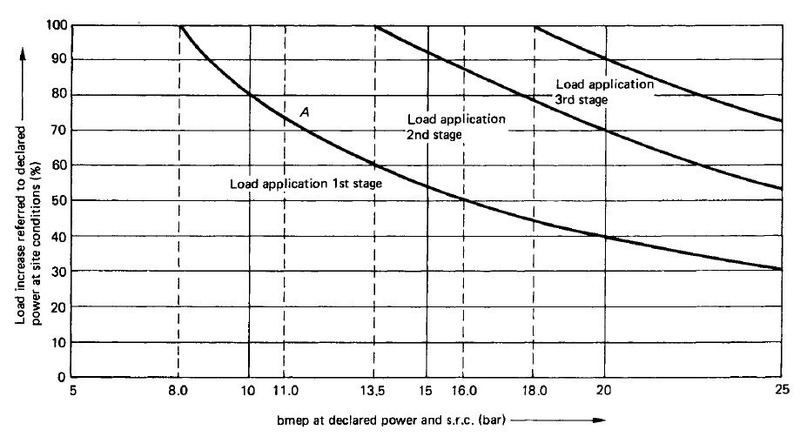 Step loading is very common when load acceptance performance criteria are required. Many turbocharged and after-cooled four-stroke diesel engines will not accept 100% block load in one step. Always investigate to ensure the selected generator set will meet application requirements. The “largest motor first” rule: In many applications the generator set is sized to pick up all loads in one step. In some applications it is advantageous to start up the loads which cause the largest starting surge first and then the rest in multiple steps. Codes may require sequenced load starting to start emergency and life safety loads within as little as ten seconds, while allowing other loads longer periods of time. In general sequenced startup allows the smallest generator set in relation to the steady state load. When cycling motor loads exist, it will still be necessary to size the generator set to start the largest cycling motor last, with all other loads connected. The NFPA (National Fire Protection Association) standard 110 Standard for Emergency and Standby Power Systems requires that a generator set must be capable of picking up a 100% block load. It does not specify frequency and volt deviations. The block load capability or transient response of the gas engine generators is less than its diesel engine generators. Most of this difference is directly attributed to the inherently different fuel systems of the two engines. When the governor calls for more power, a diesel engine reacts by adding fuel directly into the cylinder. This method permits the diesel engine to accept 100% block loads with acceptable voltage dips and frequency changes. When the governor on a gas engine calls for more power, the throttle opens and a larger flow of air/fuel mixture starts moving through the after-cooler core, air intake manifold, and then into the cylinder. This time delay detracts from the gas engines capability for accepting large block loads. Load shedding determines which loads are non-critical and shed so that loads that are more critical can be given priority or additional load. Load shedding refers to the method by which needs are prioritized after the generators are started. During periods of high demand, some loads may be less important to the facility than other loads. These can be “shed”, or not powered, so the electricity can be used for predetermined, essential loads. For example: In a factory, all welding equipment and other machines may be operated, at capacity, at the same time, between 10 am and 12 noon and then again between 1 pm and 3 pm. During these times, the load to lights in the lunchroom and parking lot would be shed because they are less of a priority. Site personnel must determine the order in which generators will be started. If #1 generator is always started first, it will accumulate hours and maintenance expenses at a high rate compared to the remaining units. “Slobbering” of the generators may be another problem encountered. The last unit started may be lightly loaded and said to “slobber”. Slobber is a result of lubricating oil being drawn into the cylinder under low load conditions. This is not conducive to long life and good performance. A site may require a smaller supply of electricity on the weekend, when the loads are not as large. Generators of different sizes can be installed where the larger one(s) supply the week and the smaller the weekends. Unit shutdown order is determined by analyzing which loads can be spared at certain times while other loads are still connected. Again, maintenance implications need to be taken into consideration if it is determined that the same generator will be shutdown first each time. Redundancy refers to the method of purchasing one or more generators than needed to operate at full load. This is especially important to loads where a major percentage of it is critical. With additional generators, down-time can be kept to a minimum because an additional generator is always free to be connected. Figure.1 shows generator #5 as a swing engine; this engine can be used to backup either critical load group if one of the engines requires service. Major maintenance can be performed on a generator while the additional one is connected. If two or more additional generators are present then maintenance can be done on two or more or have a backup for the system when one is being serviced. When sizing a generator, comparing engines may be necessary to determine optimal performance, especially when motor starting. Both torque and horsepower are necessary measures but are not helpful when comparing engines of different sizes and designs. Instead, engines can be compared by referring to their brake mean effective pressure (BMEP). The “mean effective pressure” is an average of the pressure that would need to be present in the engine’s cylinder for the power and torque to be produced. BMEP refers to the brake MEP or the useful work done at the engine flywheel. The Brake Mean Effective Pressure (BMEP) is used for load step analysis and for developing a starting sequence of a generator. Case#1: If the percentage of block load is under the first load step curve, the block load can be accomplished in one step. In the next article, we will start explaining the Applicable Procedures for Generators Sizing Calculations. So, please keep following.